QVD 3.4 arrived in the new year with a few killer features, shared folders and an application server prototype amongst them. For this post we are going to concentrate on testing the shared folders functionality of QVD 3.4 using the QVD demo. If you are using a linux desktop, you’ll need to ensure you have the openssh server installed as the folder sharing requires the built in sftp server binary. There is no need to enable the openssh service, nor is this step necessary for the Windows client. If you haven’t done so already install the client for your platform, register for the demo, check your email for you login details and let’s get started. 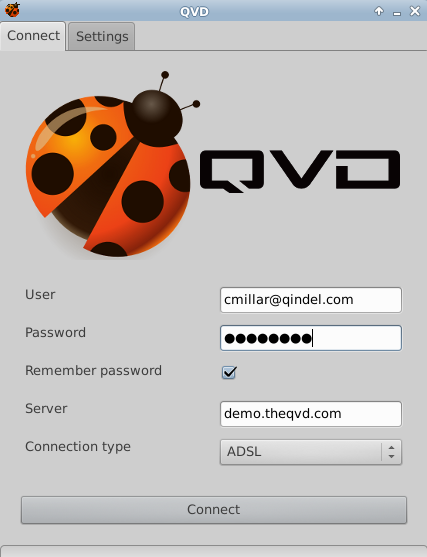 Firstly, start up the client and enter the credentials you have been sent by the QVD. Within moments you will be logged into the QVD demo which is currently serving a LXDE desktop although it could be any Linux desktop environment. So far so good, but what sets QVD 3.4 apart from its predecessors is the ability to access your local files directly from within your QVD desktop. Let’s try that. 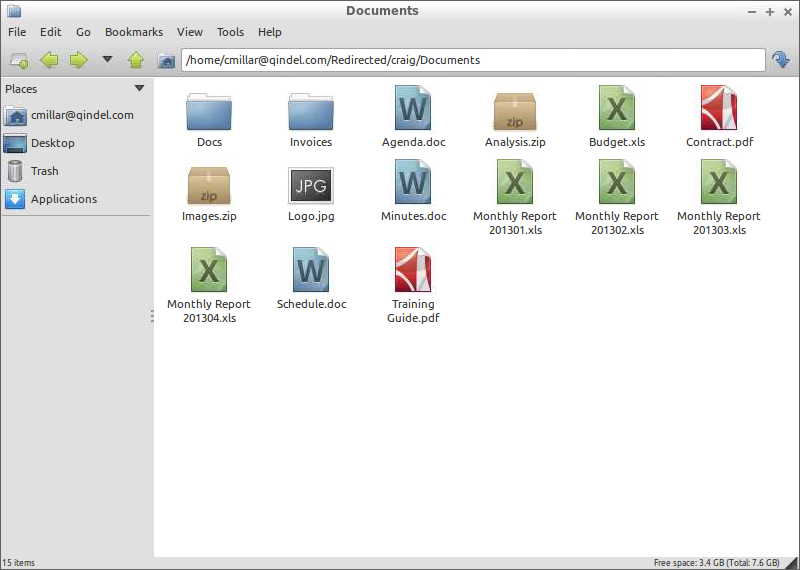 Next to the “Start” Menu QVD ladybird is an icon for the default file manager, PCManFM. Click that and you will be presented with your home folder within the QVD desktop, which is as it should be. 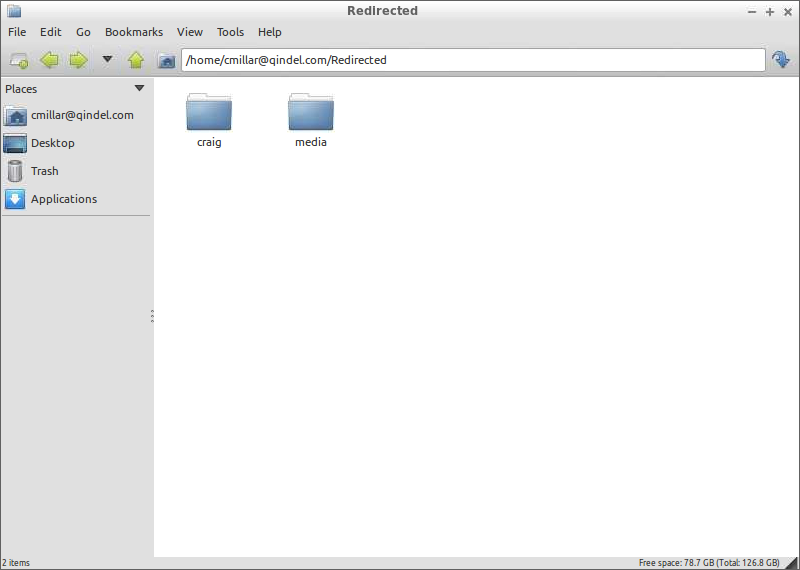 But you’ll notice within your home folder is a folder called Redirected which is a special folder created by the QVD to give you a convenient link to your local files. By default file sharing is enabled and will display your local home directory (on Windows this will be %USERPROFILE%, for Linux it will be /home/$USER) and removable storage (on Linux, /media, on Windows all existing drives available in My Computer: c:, d:, …). This is neatly illustrated by the following image, which shows my home and media folders. Digging down into the home folder and then Documents, we can see my local documents are now available directly from the QVD desktop. These files can edited directly in the QVD desktop and any changes will be saved over the QVD’s custom built protocol right back on to your local desktop. Alternatively, copy the files to the QVD desktop and back again when you have finished with them. This seamless integration between local and remote desktops provides considerable convenience to remote users.